Rory McIlroy's great Uncle was murdered by Loyalist Paramilitaries in the '70's for being Irish and because Rory's Uncle Mickey McDonald on his mother's side was a good forward on the Armagh Gaelic Football Team in the '80's. Hollywood in British Occupied Ireland is where the British secret services train and finance Loyalists to assassinate Irish people like Rory who are put under considerable pressure and have to think about their extended family. Golf: Rory McIlroy has posted an open letter on his twitter account in response to comments he made in an interview with the Daily Mail newspaper, rejecting any suggestion that he had made a decision on whom he would represent in the 2016 Olympic Games in Rio de Janeiro. The 23 year old Northern Ireland golfer stated during the newspaper interview that: “I’ve always felt more British than Irish,” during a wide ranging discussion that touched upon whether he would represent Ireland or Britain in Brazail; the first time that golf will be included in the Games. He was further quoted in the article as saying: “What makes it such an awful position to be in is I have grown up my whole life playing for Ireland under the Golfing Union of Ireland umbrella. But the fact is I have always felt more British than Irish. Maybe it is the way I was brought up, I don’t know, but I have always felt more of a connection with the UK than with Ireland. However in an open letter McIlroy rejected the notion that he had made any decision on who he would represent in the Olympics. It read: “Having just won three of my last four tournaments, including a second Major championship, I was hoping that my success on the golf course would be the more popular topic of golfing conversation today. However the issue of my cultural identity has re-emerged, and with it, the matter of my national allegiance ahead of the Rio Olympics in 2016. “I am in an extremely sensitive and difficult position and I conveyed as much in a recent newspaper interview. I am a proud product of Irish golf and the Golfing Union of Ireland and am hugely honoured to have come from very rich Irish sporting roots, winning Irish Boys, Youths and Amateur titles and playing for Ireland at all levels. I am also a proud Ulsterman who grew up in Northern Ireland which is part of the United Kingdom. That is my background and always will be. “I receive huge support from Irish and British sports fans alike and it is greatly appreciated. Likewise I feel I have a great affinity with the American sports fans. I play most of my golf in the US nowadays and I am incredibly proud to have won the US Open and US PGA Championship in the last two years. “As an international sportsman I am very lucky to be supported by people all over the world, many of whom treat me as one of their own, not matter what their nationality, or indeed mine. This is the way sport should be. “Since turning professional at 18, I have travelled the world playing the game that I love and consider myself a global player. As the World No.1 right now, I wish to be a positive role model and a sportsperson that people respect, and enjoy watching. I feel very fortunate to be in a position to play the sport that I love professionally and to have enjoyed the success that has come my way. “I wish to clarify that I have absolutely not made a decision regarding my participation in the next Olympics. On a personal level, playing in the Olympics would be a huge honour. However, the Games in Rio are still four years away and I certainly won’t be making any decisions with regards to participating any time soon. “The Olympics will be great for the growth of golf on a global scale, but my focus right now is on being the best player I can be, trying to win Major Championships and contributing to what will hopefully be a victorious European side at the forthcoming Ryder Cup Matches against the USA. Rory McIlroy MBE (born 4 May 1989) is a Northern Irish professional golfer fromHolywood in County Down who is a member of both the European and PGA Tours.He is the current World Number One and a two-time major champion. On 19 June 2011 he won the U.S. Open, setting a record score of 16-under-par on his way to an eight-shot victory. He then won the 2012 PGA Championship at Kiawah Island by a record eight shots on 12 August 2012 for his second major championship victory. He has been cited as the most exciting young prospect in golf and having the potential to become one of the highest earners in sports in terms of endorsements. McIlroy has represented Europe, Great Britain & Ireland, and Ireland as both an amateur and a professional. He had a successful amateur career, topping the World Amateur Golf Ranking for one week as a 17-year-old in 2007. Later that year he turned professional and soon established himself on the European Tour. He had his first win on the European Tour in 2009, and on the PGA Tour in 2010. He represented Europe in the 2010 Ryder Cup. In 2011 at the age of 22, he became the youngest player ever to reach €10 million in career earnings on the European Tour. In 2012 he became the youngest player to reach $10 million in career earnings on the PGA Tour. SportsPro has McIlroy rated as the second most marketable athlete in the worldwhile the Golf Club Managers' Association's Golf Club Management magazine ranked him as the second most powerful person in British golf. McIlroy was born in Holywood, County Down, Northern Ireland, the only child of Gerry and Rosie (née McDonald) McIlroy; he attended St. Patrick's Primary School and then Sullivan Upper School. He was introduced to golf at an exceptionally young age by his father, who coached him. Gerry McIlroy is a fine golfer himself, who once played at a scratch handicap level. Young Rory gave early evidence of his golf potential by hitting a 40-yard drive at the age of two. Rory asked his father virtually every day to take him to the golf course. Family lore relates that he received a new golf club as a present, being shown the correct grip by his father, then taking the club to bed with him that night, with his hands holding the club properly. A video on golf technique produced by champion Nick Faldo was his early favourite. Gerry McIlroy held down several jobs to earn additional income for his son's golf development. Rory's mother worked extra shifts at the local 3M plant. Rory's first significant international victory came in the World Championship for the 9–10 age group bracket at theDoral Golf Resort & Spa in Miami, Florida. He learned his early golf at the Holywood Golf Club, which he still retains as his home course. He became the youngest club member at age seven. He started his early training with Michael Bannon, previously the Golf Professional of Holywood Golf Club, who is also his current coach and dedicated mentor. McIlroy at age 15 was a member of Europe's winning 2004 Junior Ryder Cup team; the event was held in Ohio. In 2005 he became the youngest-ever winner of both the West of Ireland Championship and the Irish Close Championship. He retained the West of Ireland Championship in 2006 and followed that up with back-to-back wins at the Irish Close Championship. In August 2006, he won the European Amateur at Biella Golf Club, near Milan, Italy with the score of 274. In late 2004, at age 15, he signed a letter of intent to play collegiate golf at East Tennessee State University, but after his wins in 2005, he decided to forgo the golf scholarship and continue to play amateur golf in Europe. McIlroy shot an opening round of 3-under-par 68 at the 2007 Open Championship at Carnoustie, his first major championship entry. He shot +5 overall and was the highest finishing amateur, winning the silver medal. In July 2005, at age 16, McIlroy shot a new competitive course record score of 61 on the Dunluce links of Royal Portrush Golf Club.In October 2006, McIlroy represented Ireland in the Eisenhower Trophy, which is the Amateur World Team Championship. On 6 February 2007, he became the second man to top the World Amateur Golf Ranking, though he lost the top spot after just one week. McIlroy was part of the Great Britain & Ireland team at the 2007 Walker Cup, held at the Royal County Down Golf Club. On the first day of the event he was paired with Jonathan Caldwell for morning foursomes, and the match was halved. In the afternoon he faced Billy Horschel in singles, but Horschel won 1 up. On the second day McIlroy and Caldwell lost in morning foursomes by the score of 2 & 1. In the afternoon he faced Horschel in singles again, and this time he won by the score of 1 up. McIlroy's overall record was (1–2–1) in Win-Loss-Tie format. The United States came out victorious by a score of 12½ to 11½. He made his first appearance in a European Tour event a few days after turning 16, when he took part in the 2005 British Masters. He made the cut on the European Tour for the first time as a 17-year-old at the 2007 Dubai Desert Classic, where he had to forego prize money of over €7,600 due to his amateur status. McIlroy turned professional on 19 September 2007, the day before the Quinn Direct British Masters. He signed with International Sports Management. At the Quinn Direct British Masters, McIlroy shot 290 (+2), which put him in a tie for 42nd place. He finished in 3rd place at the Alfred Dunhill Links Championship in October. He became the youngest Affiliate Member in the history of The European Tour to earn a tour card. The next week, he secured his card for 2008 by finishing in a tie for 4th place at the Open de Madrid Valle Romano. On the 2007 European Tour season, he earned €277,255 and finished in 95th place on the Order of Merit list. He was the highest ranked associate member. Before his season started, Tiger Woods invited McIlroy to play in the 2007 Target World Challenge, held in December. McIlroy declined the invitation, preferring to play the European Open. McIlroy started his 2008 European Tour season at the UBS Hong Kong Open. He did not make the one-under cut. He entered the top 200 of the Official World Golf Ranking for the first time on 27 January 2008. 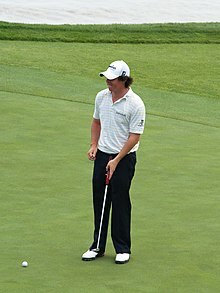 On 7 September 2008, McIlroy took a four-shot lead into the final round of the Omega European Masters in Crans-sur-Sierre, Switzerland, but finished in a tie for first place with FrenchmanJean-François Lucquin and lost in a play-off. McIlroy finished the Europen Tour season in November 2008 with six top-10 placements and ranked 79th in the World Golf Ranking. After finishing second in the UBS Hong Kong Open in November 2008, McIlroy attained his highest world ranking position of 50.He finished the 2008 calendar year at 39th in the world rankings after finishing joint 3rd in the South African Open. This earned him an invitation to the 2009 Masters Tournament. His first professional win came at age 19 when he won the Dubai Desert Classic on 1 February 2009, this win took him to 16th in the world rankings. In April 2009, McIlroy appeared at The Masters in his first major tournament as a professional and his first Masters Tournament. He finished the tournament tied for 20th place, two shots under par for the tournament. Of the players to make the cut, McIlroy achieved the third highest average driving distance, beaten only by Dustin Johnson and Andrés Romero. McIlroy played in two more events on the PGA Tour after the Masters including his first appearance at The Players Championship where he was cut. McIlroy then returned to Europe and recorded two top 25 finishes leading up to his first U.S. Open. He finished fifth at the BMW PGA Championship and 12th at the European Open. McIlroy played in his second major as a professional at the 2009 U.S. Open. His final round of 68 (−2) helped him finish in a tie for 10th, his first top ten finish in a major. The following week, McIlroy finished in 15th at the BMW International Open. McIlroy played in his first Open Championship as a professional in July and finished T-47. He finished T-3 at the 2009 PGA Championship. McIlroy accepted an invitation from Gary Player to participate in the 2009 Nedbank Golf Challenge at the Gary Player Country Club atSun City, South Africa in December, but withdrew after feeling unwell. McIlroy during a practice round of the2010 PGA Championship. McIlroy finished 3rd at the 2010 Abu Dhabi Golf Championship. McIlroy failed to defend his title at the 2010 Dubai Desert Classic after shooting a round of final-round 73 to finish in a tie for fifth place. On 2 May, McIlroy recorded his first PGA Tour win after shooting 62 in the final round of theQuail Hollow Championship. The round set a new course record, and concluded with six consecutive scores of three. He became the first player since Tiger Woods to win a PGA Tour event prior to his 21st birthday. The win earned him a two-year Tour exemption.On 2 June, McIlroy played at the Memorial Skins Tournament at Muirfield Village Golf Club in Dublin, Ohio. McIlroy finished T10 at the Memorial Tournament. On 15 July 2010, McIlroy confirmed his status as a favourite for the Open title on the Old Course at St Andrews by shooting a 9-under-par 63 on the opening day, the lowest-ever first round score in the 150-year history of the Open Championship, and tying the course record. He missed a putt on the 17th, "The Road Hole", that would have given him the outright record. His tied third finish in the 2010 Open Championship sent him to a career high world ranking of seventh. McIlroy missed out on a chance to win the 2010 PGA Championship when he three-putted the 15th green to fall out of a tie for the lead. His final-hole birdie putt narrowly missed the hole to leave him a shot out of the playoff between Bubba Watson and eventual winner Martin Kaymer. McIlroy finished tied for third. On 4 October 2010, McIlroy won a crucial half-point to help Europe regain theRyder Cup. Following the Ryder Cup, he announced in November that he would return to play full-time on the European Tour, although he also stated that he would continue to play 11 or 12 tournaments in the U.S. per year. He attributed the decision to having closer friends on the European Tour, his part in the Ryder Cup victory, and wanting to be nearer his girlfriend and family. McIlroy later stated that he regretted his 2010 decision to give up his PGA Tour card, and his skipping the 2010 Players Championship at Sawgrass. McIlroy's manager Chubby Chandler's aversion to the PGA Tour was cited by McIlroy as one of the main reasons for their later professional split. On 7 April, McIlroy shot a bogey-free 7-under-par 65 in the first round of the Masters Tournament in Augusta, Georgia to take the lead after the first day of the four-day competition. He is the youngest player to date to lead the Masters at the close of the first day. On Friday, he shot 69 to lead by two strokes over Jason Day with a 10-under-par score. On Saturday, he shot 70 to finish at 12-under-par, four strokes ahead of four other challengers. However, on the fourth and final day, he shot the worst round in history by any professional golfer leading after the third round of the Masters. McIlroy scored one-over-par 37 on the first nine, and still had the lead, but shot a round of 80, finishing T15 at 4-under for the tournament. McIlroy failed to make the cut in his title defence at Quail Hollow in early May, was well off the pace at the BMW PGA Championship. He held the 18 hole lead at the Memorial Tournament but finished in 5th place. McIlroy won the U.S. Open held at Congressional in Bethesda, Maryland on 19 June winning by eight shots over Jason Day. McIlroy set several records in his victory, most notably, his 72-hole aggregate score of 268 (16-under) was a new U.S. Open record. The 268 aggregate beat the previous record of 272 held by Jack Nicklaus (Baltusrol, 1980), Lee Janzen (Baltusrol, 1993), Tiger Woods (Pebble Beach, 2000), and Jim Furyk (Olympia Fields, 2003). The 16-under in relation to par beat Tiger Woods' 12 under at Pebble Beach Golf Links in 2000. He became the youngest winner since Bobby Jones in 1923. The victory lifted McIlroy's position in the Official World Golf Ranking to a then career high of number four. In preparation for the US Open, McIlroy practised at Pine Valley Golf Club in New Jersey, rather than at Congressional, but did play two practice rounds at Congressional about a week before the start of the Open, after returning from a two-day trip to Haiti as an ambassador for UNICEF. On 17 June during the second round, McIlroy became the first player in the history of the tournament to amass a score of 13-under-par at any point in the tournament. He achieved the feat by making a birdie at the 17th hole in the second round. Despite a double bogey on the final hole, his two-day total of 131 (65–66, 11-under par) set a record as the lowest 36-hole total in U.S. Open history. The score was one better than Ricky Barnes' 132 in 2009. He was also the fastest golfer to reach double digits under par in the U.S. Open, reaching 10 under par in 26 holes. On 18 June, during the U.S. Open's third round, he became the first player to reach 14-under par at the tournament by making a birdie at the 15th hole, on his way to a 54-hole U.S. Open record of 199. In doing so, he also built an eight-shot lead going into the final round. A final round of 69 allowed him to claim his first major championship setting the 72-hole record. The win meant that, in a poll conducted a few days later, 39 per cent of British 18-to-24-year-olds said they were inspired to try golf for the first time because of him. Partly due to this, he was named by Golf Club Management magazine as the second most powerful person in British golf. McIlroy took a month off from competitive golf. At The Open Championship he struggled in tough weather over a difficult layout atRoyal St George's Golf Club, failing to contend with the conditions. He was again a non-factor at the PGA Championship at Atlanta Athletic Club after injuring his wrist on the 3rd hole of the first round after attempting to hit a ball behind a tree root. McIlroy went on to win the Lake Malaren Shanghai Masters in a playoff against Anthony Kim. In November, he finished tied for 4th at the WGC-HSBC Champions to move to a then career high of number two in the Official World Golf Ranking. In December 2011, he won the UBS Hong Kong Open by 2 shots. McIlroy's first tournament of the year was at the Abu Dhabi HSBC Golf Championship during the Dubai swing of the European Tour at the end of January. The tournament was in the spotlight due to its high profile field including former and current World Number 1 Tiger Woods and Luke Donald respectively, and World Number 2 Lee Westwood. McIlroy also played alongside Woods and Donald in the marquee group during the first two days. McIlroy shot rounds of 67-72-68 to start round 4 in joint 3rd place behind joint leaders Robert Rock and Tiger Woods. He shot a 3-under-par 69 on Sunday to finish lone second, one shot behind winner Robert Rock. McIlroy continued the Dubai swing at theOmega Dubai Desert Classic where he finished tied 5th on 14-under-par, four shots behind winner Rafael Cabrera-Bello. He continued to play well at the WGC-Accenture Match Play Championship in Arizona where he won matches against George Coetzee, Anders Hanson,Miguel Ángel Jiménez, Bae Sang-moon and Lee Westwood before losing to Hunter Mahanin the final. After 10 holes in the final match, McIlroy was 4 down to Mahan, but cut the deficit to 2 down through 16 holes. The 17th hole was halved with pars, securing the win for Mahan. There was anticipation surrounding the semi-final match between McIlroy and Westwood, as the winner would become the number one golfer in the world if they also won the final. McIlroy's runner-up finish moved him up to number two in the world while also putting him at the top of the Race to Dubai leaderboard. Two weeks later, he lost the number one spot to Luke Donald but regained the top spot on 15 April. After being number one for two weeks, he lost the spot to Donald again on 29 April. The following week, McIlroy continued good form and won the Honda Classic in Palm Beach Gardens, Florida, and with it claimed the Number 1 spot in the world rankings. He started the fourth round in first place at 11-under-par after rounds of 66-67-66, ahead of a chasing pack including Tiger Woods, Lee Westwoodand Keegan Bradley. McIlroy shot a final round of 69 to claim his third PGA Tour title and finished two shots ahead of Tiger Woods andTom Gillis. McIlroy became the second youngest World Number 1 and moved up to fourth place in the FedEx Cup standings. He played the following week at the WGC-Cadillac Championship in Miami, Florida. His recent good form began to dwindle slightly on Thursday, when he shot a 1-over par 73. However, he shot 69 and 65 the next two days to begin the fourth round in tied 8th place. Going into the back 9 on Sunday, he had a chance of winning his second title of 2012 in as many weeks due to the leaders faltering. However two late bogeys halted his chance and he settled for 3rd place, two shots behind winner Justin Rose. McIlroy lost his number one ranking on 18 March to Luke Donald after Donald won the Transitions Championship. McIlroy was one stroke off of the lead going into the weekend at The Masters but struggled in his last two rounds and finished in a tie for 40th. He regained the top spot in the world rankings on 15 April but lost it to Donald again on 29 April. On 6 May, McIlroy was in contention at the Wells Fargo Championship and went to a playoff with Rickie Fowler and D. A. Points. Fowler won the tournament on the first playoff hole with a birdie. The runner-up finish put McIlroy back at the top of the Official World Golf Ranking. After the runner-up finish, McIlroy would later miss the cut in his next three events, and fell again from number one ranking. McIlroy won the 2012 PGA Championship by a record eight strokes, which was done with a birdie on the final hole. The record stood since Jack Nicklaus won the 1980 PGA Championship by seven strokes. McIlroy started the final round with a three shot lead and shot a bogey free 66 to run away from the field. With this win, McIlroy became the youngest multiple major champion since Seve Ballesteros won the 1980 Masters, and the 6th youngest of all time. The win also helped McIlroy regain the world number one ranking. McIlroy finished the regular season third in the FedEx Cup standings. At The Barclays, the first of four playoff events, he finished in a tie for 24th, dropping him to fourth in the standings. McIlroy won the following week at the Deutsche Bank Championship to take the top spot in the standings. McIlroy entered the final round three strokes behind Louis Oosthuizen and defeated him by one stroke. The win also put McIlroy at the top of the PGA Tour money list. McIlroy's success continued the following week when he won the BMW Championship. With the win, he became the first European to win four PGA Tour events in a single season and the only person other than Tiger Woods to win four events in a season since 2005. McIlroy employs the interlocking grip on full shots. He has worked with various professional golfers since he was young, includingDarren Clarke, Nick Faldo, and Graeme McDowell. McDowell frequently plays practice rounds at Tour events with McIlroy. McIlroy has recently[when?] obtained putting assistance and instruction from Dave Stockton, a retired PGA Tour player who works as a putting instructor. He was first managed by Englishman Andrew "Chubby" Chandler, a former European Tour player who founded International Sports Management (ISM). McIlroy left ISM in 2011, with McIlroy joining Dublin-based Horizon Sports Management. Michael Bannon is expected to work full-time with Mcllroy beginning in October 2012. On 17 August 2010, McIlroy answered a media question regarding Tiger Woods' potential of getting a captain's pick in the Ryder Cup(despite his poor play at the time) by saying that any member of the European Team would "fancy his chances against him". In May 2011, McIlroy was criticised for skipping The Players Championship. The skip was controversial because 48 of the top 50 in the world participated in it, the other golfer skipping being fellow European Lee Westwood. On 17 July 2011, following a poor showing over the weekend in the 2011 Open Championship, McIlroy told the media that he was "not a fan of golf tournaments that are predicted so much by the weather,", and saying he would rather "wait for a year when the weather is nice" instead of tuning his game to prepare for the Open Championship. He also added that he would "rather play when it's 80 degrees and sunny and not much wind". On 28 July 2011, after being criticised on air by commentator Jay Townsend about McIlroy's questionable course management skills during the first round of the Irish Open, McIlroy wrote on Twitter telling Townsend to "shut up" and saying Townsend is a "failed golfer" and that "his opinion meant nothing". Later, McIlroy stood by his comments and stated that his comments were made in defence of his caddie J. P. Fitzgerald whom Townsend had been blaming for McIlroy's course management since 2008. McIlroy has self-identified as British and carries a British passport, although he usually shows reluctance to be drawn into a debate on his nationality. When in Northern Ireland, he lives near the town of Carryduff in County Down, about 20 minutes from Belfast. The land around his house includes a custom-made practice facility, as well as a scaled-down football pitch. He is an Ambassador for UNICEF Ireland and made his first visit to Haiti with UNICEF in June 2011. His great uncle Joe McIlroy was killed by the Ulster Volunteer Force at his east Belfast home in November 1972. As of 2011 he has been dating Danish tennis professional Caroline Wozniacki. McIlroy is a fan of Premier League team Manchester United. 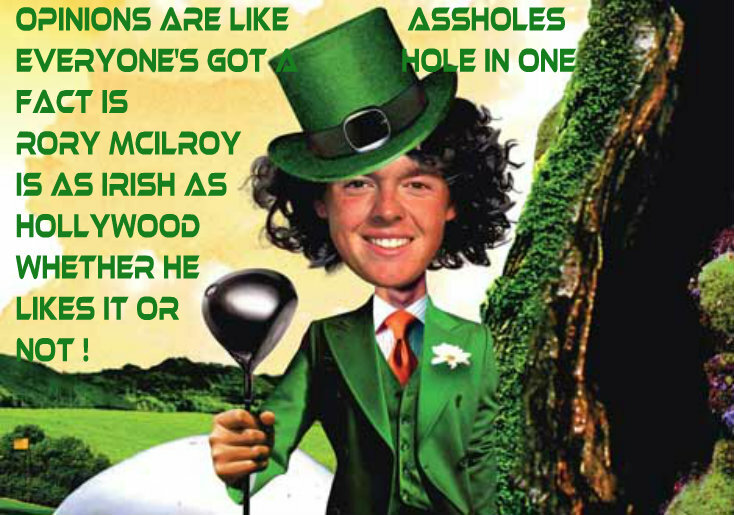 ^ McIlroy was not a member of the PGA Tour in 2007, 2009 or 2011 so he was not included on the money list.